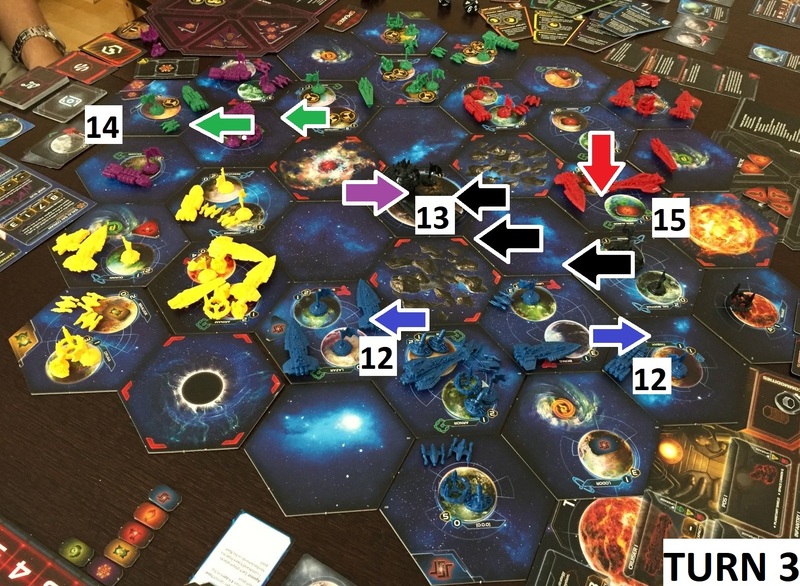 Last weekend we had again possibility to play Twilight Imperium – our first encounter is reported HERE. Such occasion – to gather 6 people for a ~9-10 hours session – is a rare case but definitely worth the effort. The game really shines with six players, and although it takes some time – gives a lot of fun. (1) I had possibility to take over two systems. (5) …while Filip was overwhelming galaxy with his presence taking 3 of them. (6) Marcin and his telepathic Nalu Collective had to decide to move towards one of his neighbors. He had chosen Filip – which had later on very serious consequences. (7) The action starts! 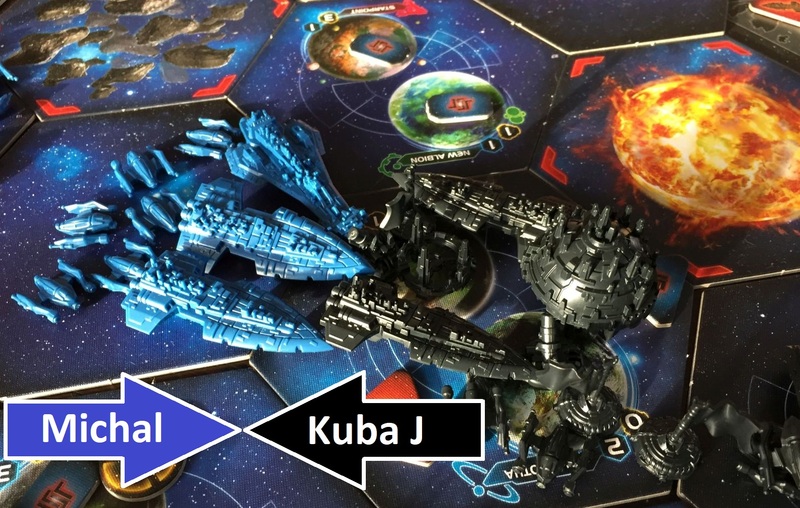 It was very close for hostilities to break on the border between me (Lizix Mindnet) and Kuba J (The Embers of Muaat). However, as my civilization was the only one on the board who could really knock out the War Sun out of game, Kuba J decided not to attack and we signed the ceasefire. (12) Finally, things start to move quickly! In my sector, after diplomatic offensive, I managed to grab another two system and four planets. The economic foundations of Lizix Mindnet are finally established! (13) Filip (The Winnu) using his special ability takes Mercator. He is immediately challenged by War Sun and Kuba J, being annihilated as a result… You do no mess with War Sun! (18) I mentioned that Dominik and his fleet moved dangerously close to Kuba J home-world. That had to be managed, and the War Sun fleet crushes again his opponents. Haven’t I said it already? You do not mess with War Sun!! (21) The decimation of FIlip’s fleets and partition of his civilization continues. Both Marcin and Kuba G are cooperating in that despicable endeavor! 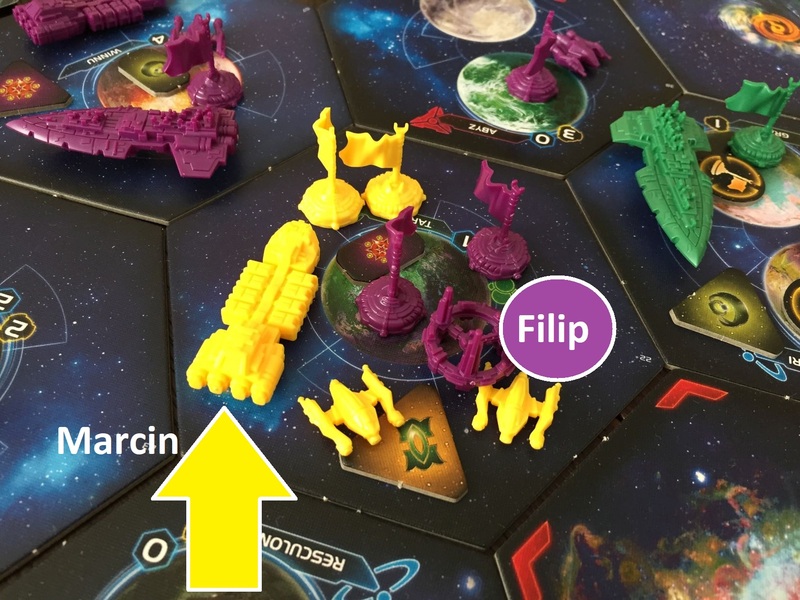 (23) First, Filip attacks Marcin – he is relentless in his effort to battle back some systems and he manages to take over a planet! This was long, hard-fought game with Kuba G grasping the victory in last moment. Tons of praises should go towards Filip, who did not break down and fought till the end. 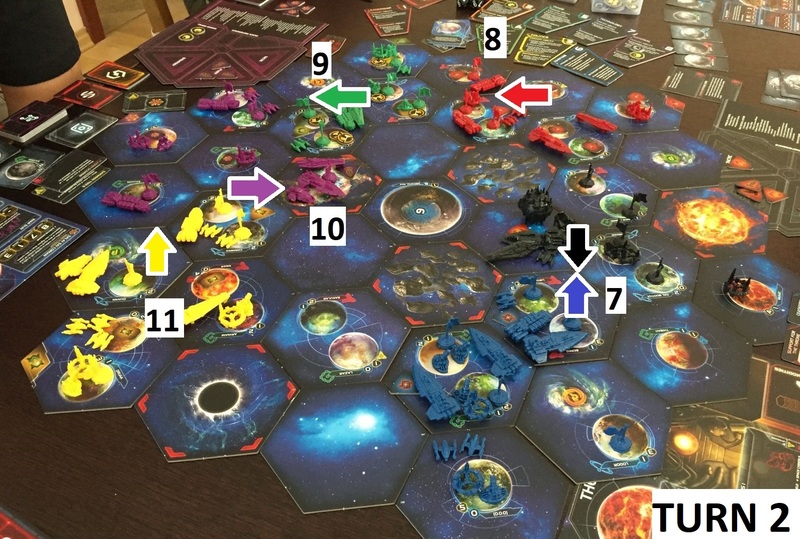 We are getting better at this game with every session but seems that again we played some rules wrong (do you really, before agenda phase, turn up all planets so you have full spectrum of your worlds available for voting?). Anyhow, that was much fun, great company and time well spent! 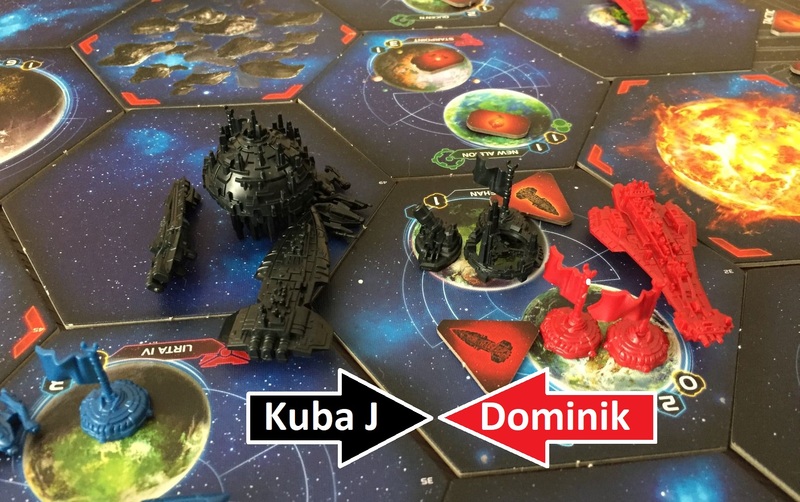 from my point of view( Kuba J., black color, with War Sun) : as neighbour of potential contender/winner(as in most games Michal should be regarded as such) and far from the winner from previous game and also likely contender/winner (other player, next to me, Red, was Dominik, who tried TE for the first time, and i didn’t expect him to win in his debut, we had Filip, who had the weakest race( only bonus hehad was with Mecatol, and even if he reached the center before me , with me having the War Sun he wouldn’t be able to keep it for too long), the last player was Marcin, who had Michal on the left, and Filip on the right, so i was quite sure he will focus on Filip, as Michal is always very dangerous, so it’s good to have peace with him 😉 . 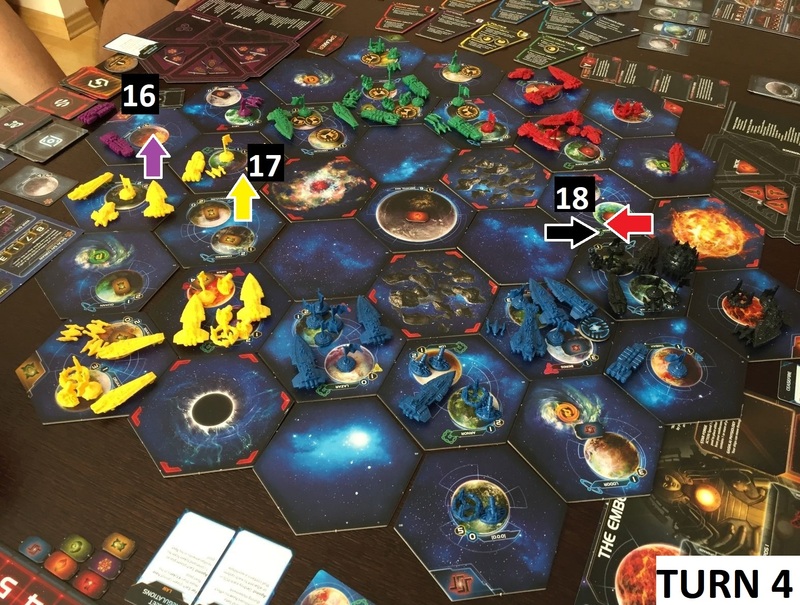 In my first turn i picked Warfare- as my troops were small and besides my war sun had no esccort, i had to take planets fast, so i could build strong esocrt for my only advantage in game. In my 2nd move with War Sun i had a most important decision to make,whether to go to left and face Michal, or go right and meet with potentially less aggressive Dominik. I knew that if i went to the left, it would probably end up with war and without strong support to War Sun i might have lost my only strenght in game, so i went right and signed treaty (for 1 VP) with Dominik. in the 2nd turn i think i again had warfare and i was about to strike at Mecatol and could occupy it as a first player (1 VP), but when Michal took planets next to my sector and Dominik started to build armies next to me as well i stopped to control the situation , threatened Michal and signed a cease fire with him(very good deal, as if broekn it blocks a sector and allows regrouping). turn 3, if i could i would take imperial, but i think Kuba G.took it before me, Filip took Mecatol for 1 VP before me, built PDS and hoped i wouldn’t strike, but secured by MIchal’s cease-fire and 1VP agreement with Dominik i attacked mecatol and didn’t loose anything (maybe 1 fighter), after that move Dominik stabbed me in the back and took my sector with 2 planets(i expected that move, too tasty targets to leave unprotected). 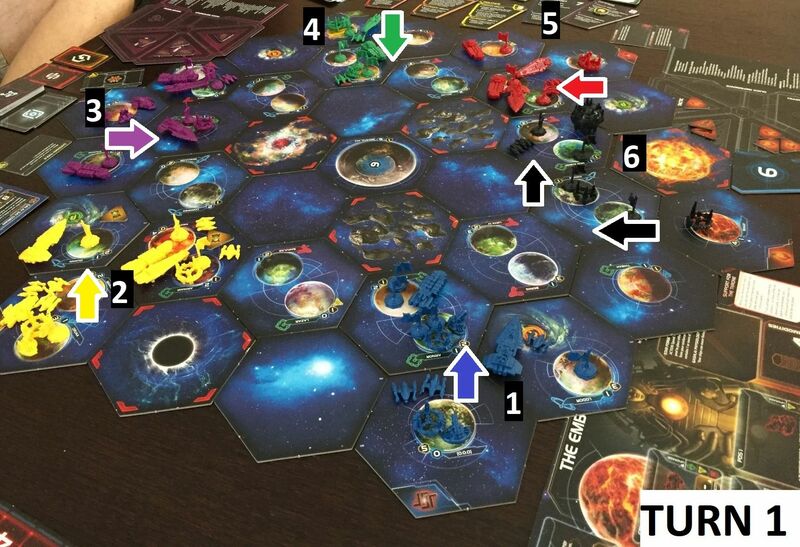 For the next 2 turns i’ve been taking imperial cards, unfortunatelly i couldn’t do secret objectives(only 1/3 during game) , but it gave me 2 VP, during that time Dominik attcked my another sector next to my home planet, so i was forced to retreat from mecatol as without home secotr i wouldn’t be able to score objectives, i took back the planet Dominik stole from me in my 2nd sector(and resined 1VP agreement), since then all i had left were home and its neighbouring sector with , altogether with 3 planets, having Michal’s powerhouse next to me. if he could increase fleetabove 4, he could challenge me and possibly destroy the Wars Sun and change the result of the game. Due to laws he couldn’t and at the end , without direct hit cards in hand(unlike me) he posed no threat to my ward sun wit 2 dreadnought, and desperate attack to earn secret objective VP was doomed to fail (besides me noone had war sun, and only filip had a flagship, i’ve destroyed Dominik’s flagship while i reconquered my planet and he couldn’t build another one, so at the end of a game i was the only player to destroy 2 flagships, but i didn’t have such objective to score). 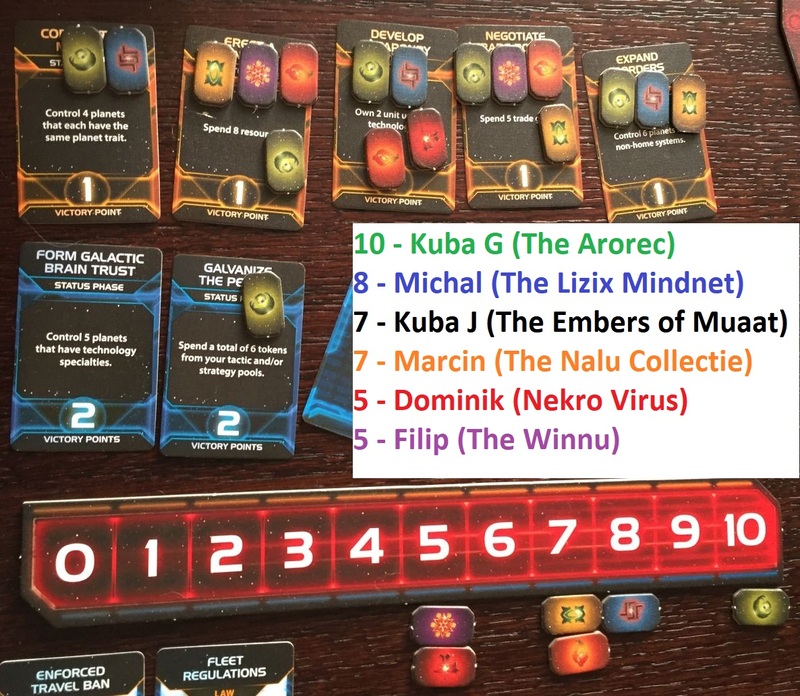 at the end – Michał wrote about law which had a big impact on a game, limiting army size to 4, but he didn’t mention we also had a law that blocked all wormholes, which secured Kuba G. backyard(neighbouring with Michal), also we could pass law which would destroy all PDS’ (Michal, Marcin, Kuba G. had strong defences with upgraded PDS’), then, with opened wormholes board would be an open war zone, but since everybody had PDS’s and wormholes closed, it was relatively peacful(taking easy targets, often away from PDS range). M20336, thanks a lot for the article post.Much thanks again. Fantastic. 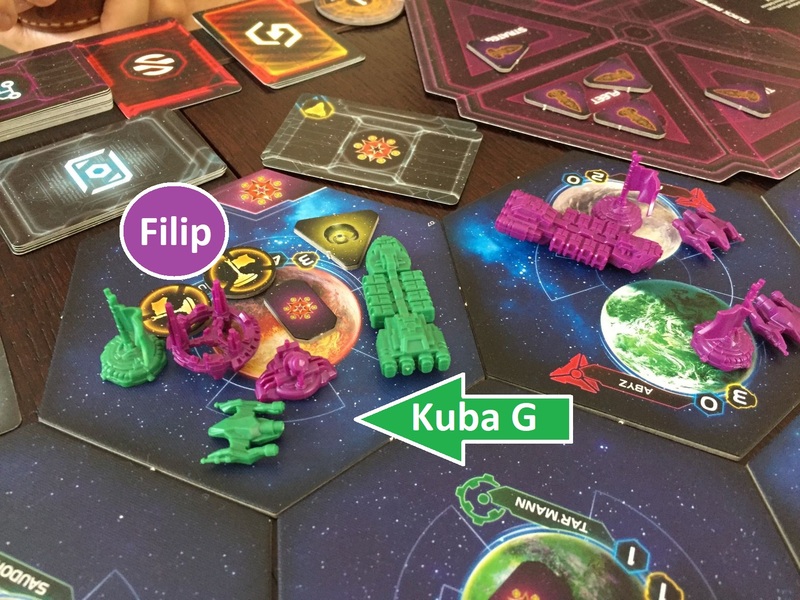 From my point of view (Kuba G, green color, the plant guy ;-)) it was quite a thrilling game, full of unexpected events. First of all, I started very slow. I was able to colonize on the first round only one system. Meanwhile my neighbors expanded toward my borders successfully preventing me from further peaceful expansion. 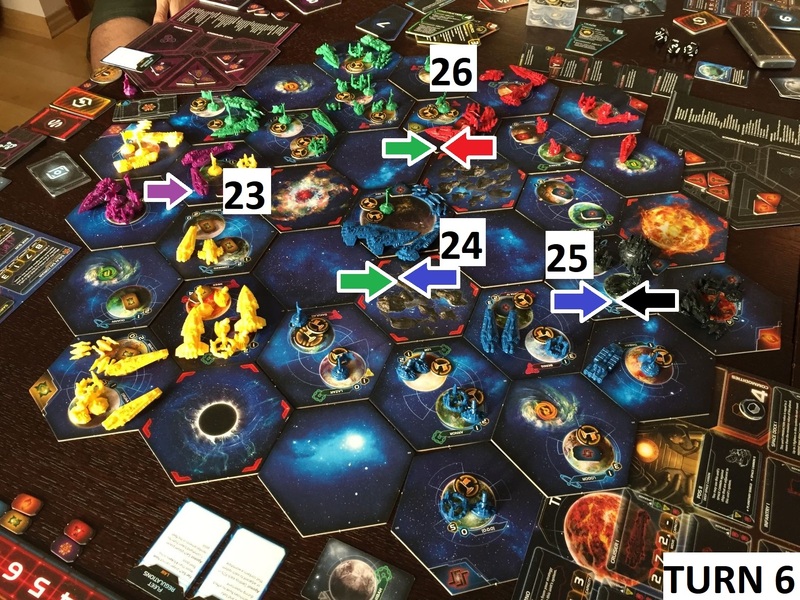 At the beginning of the second round I had poor space fleet and a mixture of planets rather rich in influence but not in production. The only system which could keep me in the game was a system toward Filip’s border with two planets. I was able to negotiate with him to peacefully gain control over it. At the same time Dominik took the last system I could potentially expand which was near my homeworld. So I ended peaceful expansion on 3 systems and 5 planets, Definitely too little to think about final success. 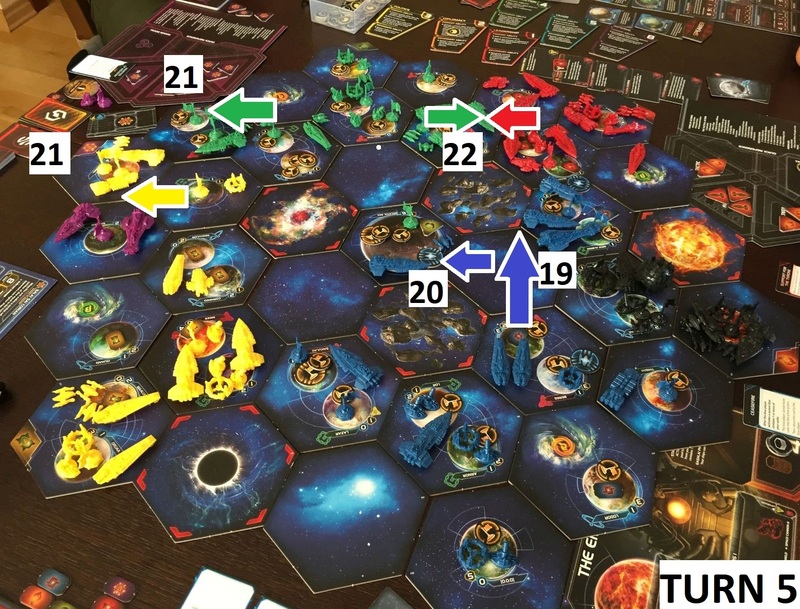 Fortunately my neighbors were not interested to test the growing land power of plants and involved themselves in rapid expansion (Dominik at the same time of the game had 7 planets and 5 systems) or Mercatol push – Filip. At the same time, Michał, who was not particularly counter by anybody else colonize 6 planets and have 3 more planets at his direct reach. Marcin decided not to fight with Michał and moved toward Filip. During third turn it was obvious that military expansion is the only way to counter Michał. 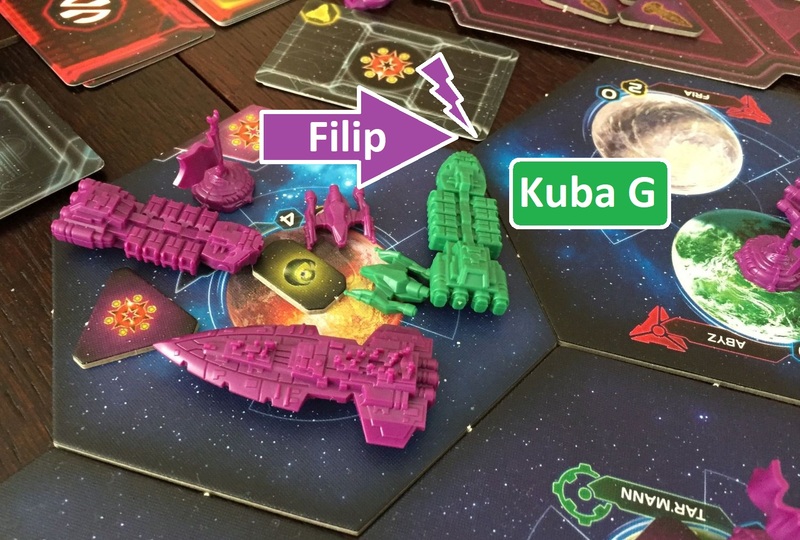 Filip and Kuba J. clashed over Mercatol which crippled Filip’s force and let the force of Kuba J. untouched but far from his initial systems. 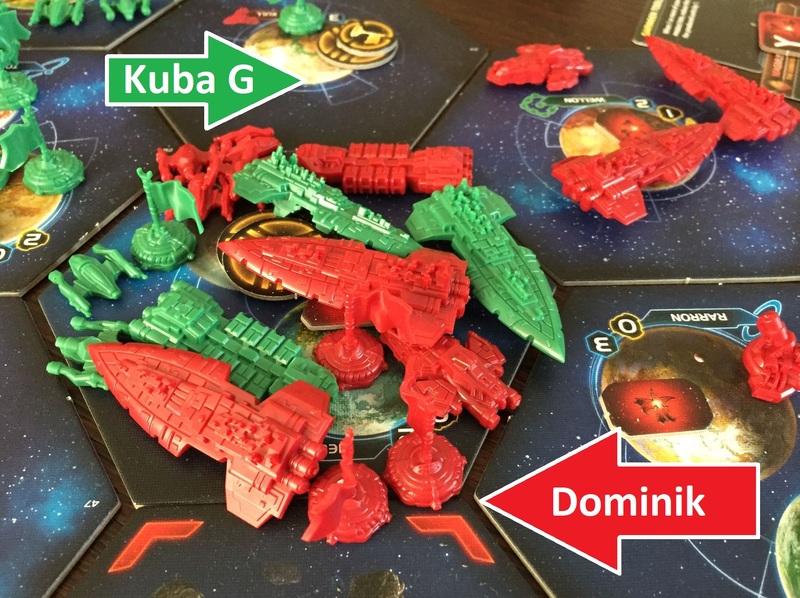 As a result in order to gain some additional territory Dominik decided to attack a poor defended system of Kuba J. and I decided to took the role of bad boy and attacked Filip’s homeworld. The attack itself turned to be a failure. 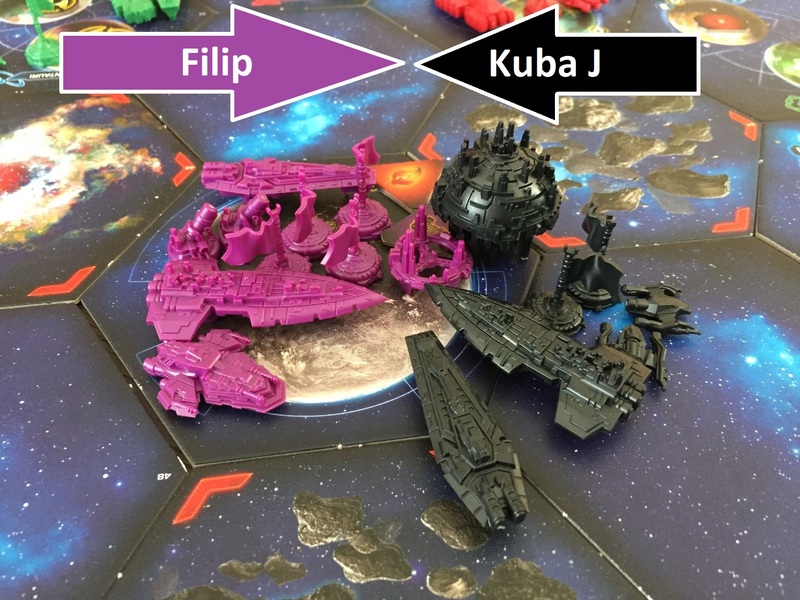 Later that round Filip was able to win the agenda which eliminated my ground forces from his homeworld and my fleet, well, frankly speaking I had barely any space fleet at that time. On the bright side I was also able to peacefully eliminate Dominik’s spaceport at my border and conquered his system next to my homeworld. As a result Dominik was able only to recruit fleet on his homeworld. Transferring this fleet toward me would have taken ages so I hoped he would continue to attack Kuba J. instead. On fourth round I gain a new non-formal ally – Marcin – who decided that Filip is an easier opponent then Michał – who was at that time at the peak of his might. My other neighbor, decided as I hoped that it is easier to attack Kuba J. As mentioned before my forces on Filip’s homeworld were unfortunately annihilated but I managed to used planet’s production and enlisted sizeable space and land army to expand later on. This round, despite initial failure regarding attack on Filip’s turned to be the background of my final success. Both my neighbors were involved in fights far from my borders (Filip fought with Marcin and Dominik with Kuba J. (callsign – „War Sun guy”) which left me the opportunity to expand more firmly into their territory and held that ground. Since a lot of public objectives were already visible I could easily decide which planets I should expand to in order to get as many profits as possible. Everything was set for a final gambit. To make things easier during agenda phase we introduced the law that all wormholes were closed which meant that I am no longer in danger of rapid invasion of Michał force on my mainland. On round fifth, consequently I managed to conquer 4 additional planets including Mercator. It includes the richest productions planets of Filip and additional red planets necessary for fulfilling the public objectives. I had 10 planets was still a little behind Michał who managed to control 11 planets at the end of this turn but finally my economy was strong enough to secure second place just above Marcin (the proud owner of 9 planets). I had also the most powerful ground forces of all players. The final outcome of the game was decided during strategy phase of sixth round. Michał was prevented from grabing the Imperial card and quite surprisingly for me (I was the last in turn order) I managed to get Imperial card which was the most valuable card for me in my current situation. Michał, as he mentioned above, tried to make some last attacks against me and Kuba J. but he was not able to fulfill enough objectives to reach 10 points before me. From my point of view, the game was full of interactions with other players. I was involded in warmongering with both of my neighbours for 2/3 of the game. It turned out that some unspectacular moves, like destroying the spaceport of Dominik could have a great impact on the game. On the other hand simply peaceful expansion on many planets and waiting for proper objectives to appear was not agood strategy because… the proper objectives were not drafted. I have had a lot of luck but also had the impression that for the most time of the game I tried to support it with micromanagement as much as it was possible. In the end the winner is the one who scored enough VP not the one with the biggest fleet or the most impressive territory.